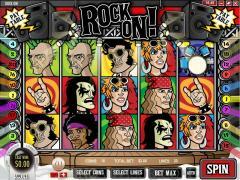 Rock On is an electrifying I-slot from Rival Gaming that has rock music as its theme. 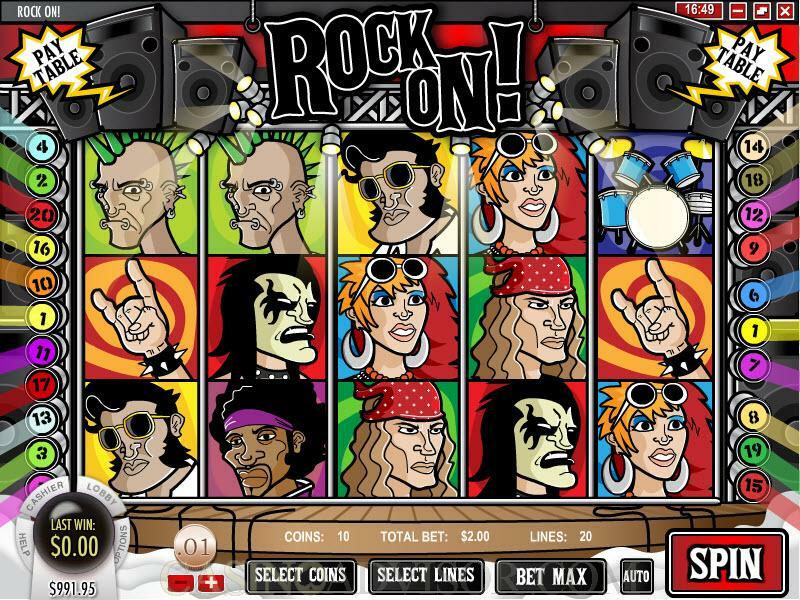 Caricatures of some of the best rock musicians grace the reels of this slot game including Elvis, George Harrison, Jimmy Hendrix, Paul Stanley and Bret Michaels. The other symbols include Green Bass Guitar, Red Electric Guitar, Drum Set, Punk Rocker, Groupie, Peace and Rock On. Rock On offers only three coin denominations, which are 0.01, 0.05 and 0.10. Because of this the betting range is on the lower side despite players being allowed to wager up to 10 coins per payline and there being 20 paylines in the game. Therefore from a purely gaming perspective this slot game will attract mostly low rollers. There are a number of special symbols in the Rock On I-slot. The Green Bass Guitar is the wild symbol. It substitutes for all symbols except the scatter and the bonus symbols. It appears on reels 1, 2 and 3 only. The Green Base Guitar is an expanding wild and covers all three rows. It is also a multiplier and doubles all payouts; however in itself it does not offer any payouts. The Drum Set is the scatter symbol and it too does not offer scatter payouts. However three or more scatter symbols anywhere on the reels trigger the free spins bonus round. 5 free spins are offered at tripled payouts. The free spins cannot be retriggered. The most exciting of the special symbols is Elvis the bonus of symbol. Three or more Elvis symbols scattered on the reels activate the Rock On Bonus Feature. This is an interactive bonus round, which is the central feature of any Rival Gaming I-slot game. In each bonus game players get to listen to one rock song. In the bonus feature players have to move the virtual guitar pick on the fret board and try to catch the musical notes falling down from the top of the screen. 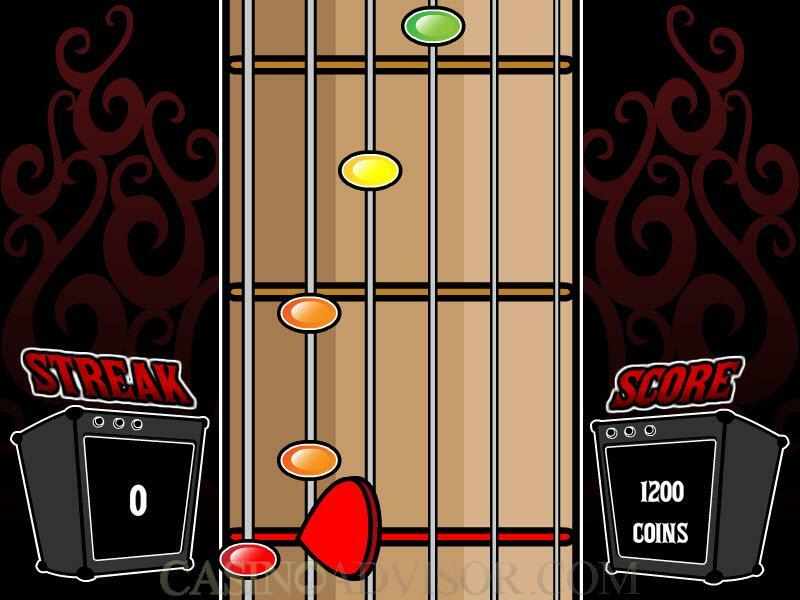 The more musical notes that the player catches, the more credits he earns in the bonus feature. Each time this round is triggered the player gets to listen to a different song from the collection of seven provided in the game. Rock On does not offer a progressive jackpot, but the fixed jackpots are above par. 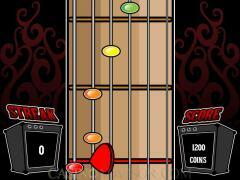 The Red Electric Guitar symbol offers a jackpot of 4000 coins when five of the symbols appear in an enabled payline. Interested in reading more detailed information about Rock On? If so Click Here for more details.